IEC 62271-209:2019 is available as IEC 62271-209:2019 RLV which contains the International Standard and its Redline version, showing all changes of the technical content compared to the previous edition.IEC 62271-209:2019 covers the connection assembly of fluid-filled and extruded cables to gas-insulated metal enclosed switchgear (GIS), in single- or three-phase arrangements where the cable terminations are fluid-filled or dry-type and there is a separating insulating barrier between the cable insulation and the gas insulation of the switchgear. This second edition cancels and replaces the first edition published in 2007. This edition constitutes a technical revision. 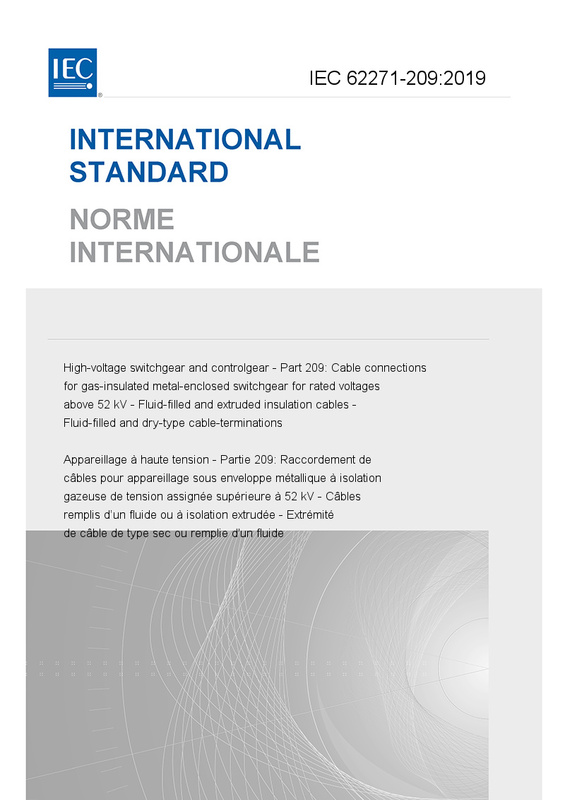 This edition includes the following significant technical changes with respect to the previous edition: a) New numbering in accordance with ISO/IEC directives, Part 2 (2016) and to IEC 62271‑1:2017; b) Clause 3: addition of a definition for plug-in cable termination, filling pressure and minimum function pressure for insulation; c) Clause 7: An additional dielectric type test for plug-in cable termination was added; also a pressure type test as well as a leak rate test on the insulator of a cable termination was implemented; d) Clause 12: New clause about safety practices; e) Clause 13: New clause about influence of the product on the environment; f) New informative Annex A: Mechanical forces applied on the flange of the cable connection enclosure.